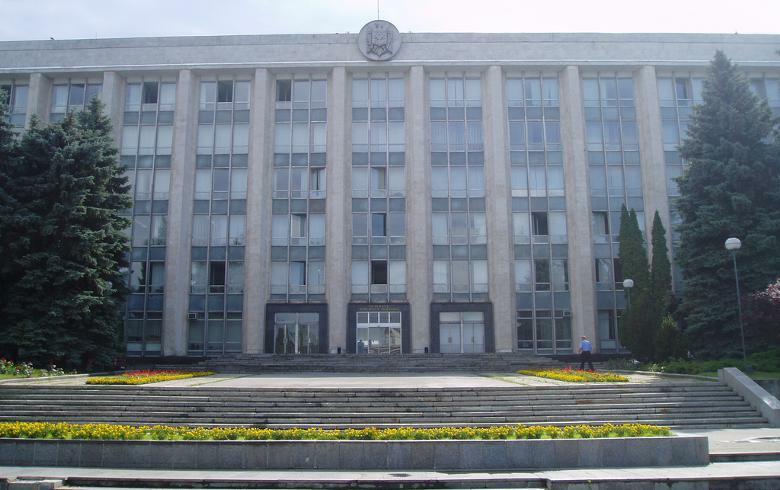 House of government, Moldova. Author: Guttorm Flatabø Licence: Creative Commons, Attribution. CHISINAU (Moldova), October 29 (SeeNews) - Moldova's pro-EU three-party coalition cabinet led by Valeriu Strelet lost on Thursday a no-confidence vote requested by the opposition parties. The country's president Nicolae Timofti will now have to nominate a new premier and if parliament rejects his candidate twice, snap elections will be called. A total of 65 legislators backed the no-confidence motion and 18 voted against. It needed at least 51 votes to pass. After the vote, Marian Lupu, leader of the Democratic Party, which is a member of the ruling coalition, said his party voted against the government because, in his words, Strelet had lost his credibility as he had tried to obstruct an ongoing investigation against former prime minister Vlad Filat. However, Lupu said his party was ready to start negotiations with the other two pro-European parties and independents in an attempt to forge a pro-EU alliance with a stable majority in parliament. Moldova's ruling coalition is made up of the Liberal Democratic Party, PLDM, the Liberal Party, PL, and the Democratic Party, PDM. The cabinet led by Strelet, vice president of PLDM, was endorsed by parliament at the end of July. Last week, 42 MPs of the Socialists of the Moldovan Republic Party, PSRM, and the Communist Party, PCRM, filed a no-confidence motion against the Moldovan cabinet, accusing Strelet of abuse of power and corruption. On October 15, Vlad Filat, leader of PLDM and former prime minister, was detained on suspicions of corruption and complicity in a bank fraud that rattled the economy of the impoverished Southeast European country.